This is canon, not a continuation, but this cover is wild enough to be a pastiche! This is a 1949 Bantam paperback edition of Conan Doyle's Memories of Sherlock Holmes. Below is a description of the cover from the inside flap. The Reichenback [sic] Falls! In a homely Alpine village, set down among lonely mountain pass, Sherlock Holmes at last met Moriarty, King of the Underworld. 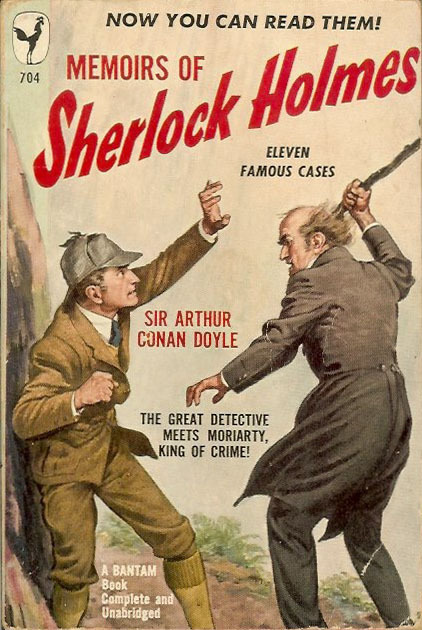 There, in the spray that steamed up from the boiling pit below, where the swollen torrent crashed down on the cold black rocks, balanced in a battle over the edge of the giant abyss, Holmes and Moriarty held their last contest, a fight to the death for one–or both.